DressesABC has teamed with many of the leading pageant dress designers to offer you this stunning collection of cheap pageant dresses and discount prom gowns. Elegant and chic pageant dresses with crown-worthy designs in magnificent fabrics and colors. 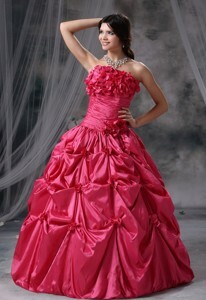 Let DressesABC help you show off your best features in a ravishing dress for your pageant or prom. After all, just like beauty queens, no two pageant dresses are alike, even if they are cut from the same cloth. Two people may wear the same dress but it may have a different look and effect on each of them. This is why it is so important to take your time when choosing the dress for your pageant. The following are just some of the many things to consider when it comes time to choose the right dress for you. One of the first things you want to consider is the shape of the dress. The silhouette of a pageant dress is important because it can accentuate or call attention to your best features and can hide areas about which you may feel insecure. If you really like your torso area, you can go with a form-fitting number. If you are self-conscious about your hips, you can have the prom dress puff out once the dress hits your hips. This is why it pays to try on pageant dresses in person. 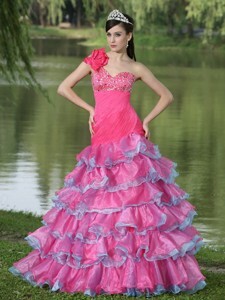 The next step to choosing between pageant dresses is to consider the color or pattern of your dress. You want to choose a color or design that is flattering to your coloring and will show up well on television. Thus, it pays to not only consider which colors look best on you but also which colors may not pop well on camera. When trying on pageant dresses, try looking at a pageant dress from far away. Often, a camera will not be able to pick up all of the details of a pageant dress. Thus, you may want to forgo pageant dresses that have elaborate details and go with a color that pops or design that is easy to recognize from far away. One of the most important features of your pageant dress is the neckline. 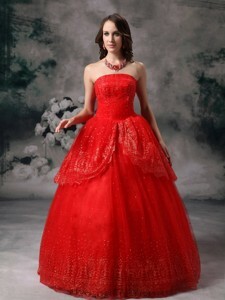 You definitely want to wear a pageant dress with a pleasing neckline, but you want to make sure that it is not too low. After all, if a neckline is too low, you risk showing too much of yourself and risk giving off a negative impression of your character. Thus, try to go with a neckline that accentuates your features in a classy way. For example, if you want to draw attention to your tones arms, you may want to go with a high neckline to draw attention to your arms. You can go with a halter top-type neckline or you could have neckline that is more square in nature. The straps of a pageant dress will affect both the neckline and the shape of the dress. There are many choices to play around with when it comes to the straps of your pageant dress. For example, you first need to decide if you are going to go with sleeves or go sleeveless. Once you make this decision, it is then time to decide if the dress will be strapless or will have straps. If you decide to have straps on your pageant dress, you then need to decide how thick these straps will be and where they will fall on your body. A tailor or seamstress can alter a dress to your specifications. Thus, you can have halter top-type straps that are then or thick, or you can go with criss-crossed straps. No matter your decision, you want to make sure that the dress does what it needs to do: stay in place when you are walking across the stage. The materials the dress is made out of will affect its overall look and how comfortable you feel in the dress. You can buy a dress that is made out of beads, or you can go with something made from anything from satin to silk. Ultimately, the materials of the dress will be affected by the look you want to go for and what feels best when you try the dress on. If you are going for a classic movie star look like a Marilyn Monroe dress, you would use different materials than if you wanted to go for a ballroom gown kind of feel. Often, if you are wearing a dress in a pageant, the dress in question will be an evening gown. If this is the case, you need to consider the length of the dress. You want something that will be easy to walk in and something that is appropriate for the event. You may want to go with a long slinky number that has a train, or you may want to go with something that falls just below the knee. It is wise not to go too long or too short when it comes to pageant dresses. Anything too short could give off the wrong impression and could result in an embarrassing situation if you fall down, and anything too long could really make you stumble or make you look anything but graceful. If you know you are going to wear high heels for the event, it pays to wear a pair when you go to try on a dress. This way, you can make sure the length of the pageant dress is dead on and will not need any alterations.